The two candidates faced off ahead of the state's runoff election for Senate next Tuesday. JACKSON, Miss. — Democrat Mike Espy ripped into GOP Sen. Cindy Hyde-Smith Tuesday in their debate, accusing her of having given their state "another black eye" on racial issues when she said recently that she would attend a "public hanging" if invited. Hyde-Smith had just finished defending her remarks after a question from one of the panelists as the two faced off one week before voters choose between them in next Tuesday's runoff election, the final contest of the midterm election season. "This comment was twisted, was turned into a weapon to be used against me," Hyde-Smith, offering that, to anyone offended, "I certainly apologize." "No one twisted your comments," he said. "They came out of your mouth. I don't know what's in your heart — but we all know what came out of your mouth....It's caused our state harm. It's given our state another black eye that we don't need." Hyde-Smith brought unwanted national attention to Mississippi after video surfaced of her saying earlier this month at a campaign event in Tupelo that she would be "on the front row" if a local rancher "invited me to a public hanging." Because of the state's history of lynchings and other racially motivated killings, Democrats and civil rights advocates ripped into Hyde-Smith. Since then, a recording of Hyde-Smith encouraging voter suppression and a photo of her in a confederate cap also have added fuel to the firestorm over race. Espy's campaign has called her an embarrassment to a state that has tried to demonstrate that its past is not reflective of its current values. The special election runoff to fill the remainder of former Sen. Thad Cochran's term — which runs through January 2021 — will be decided Nov. 27. In the Nov. 6 election, Hyde-Smith finished first, just ahead of Espy, in the three-way open primary. Because Hyde-Smith did not win a majority — she got 41.5 percent to Espy's 40.6 percent with Republican Chris McDaniel taking 16.5 percent — the top two finishers were forced into the runoff. Hyde-Smith brushed off the public hanging comment, saying last week in a printed statement that any attempts to turn her her remark "into a negative connotation is ridiculous." When asked by reporters to elaborate, she would only say that she already had put out a statement on the matter. At Hyde-Smith's request, the debate hall on Tuesday night was closed to the public and the press — other than the panel of journalists who were part of the program. In limited head-to-head public polling, Hyde-Smith has held a lead. Mississippi hasn't elected a Democrat to the Senate since 1982, when John C. Stennis, who first endeared himself to the state's voters as an ardent segregationist in the 1940s, won a sixth full term. If Hyde-Smith wins, Republicans will hold a 53-47 majority in the Senate in January. If voters pick Espy, that edge will be 52-48. During the debate, Hyde-Smith tied herself tightly to President Donald Trump, using her opening and closing statements to point to his planned two-stop campaign visit to help her next Monday. She portrayed Espy, a former congressman and U.S. agriculture secretary, as a pawn of Senate Minority Leader Chuck Schumer, D-N.Y., and other Democrats in Washington. "My opponent is too liberal for Mississippi," Hyde-Smith said. "You know I will stand up and protect our conservative values." And she rebuked Espy for having lobbied on behalf of the government of then-Ivory Coast President Laurent Gbagbo, whom she noted is on trial for crimes against humanity. Espy said that he dropped his contract with the dictator and later explained to reporters that he would not return the $750,000 he was paid because he had fulfilled his obligations and had used some of the money to hire subcontractors. Espy also said that, if elected, he would try to reach across the partisan divide in Washington and maintain independence on behalf of Mississippians. In doing so, he also sought to cozy up to Trump, to a point. "Mississippi first," he said of his approach, echoing Trump's "America first" slogan. At the end of the debate, Espy returned to Hyde-Smith's hanging remark, portraying her sentiments as representative of the state's past. "I’m not going back to yesteryear," he said. "We are moving forward." 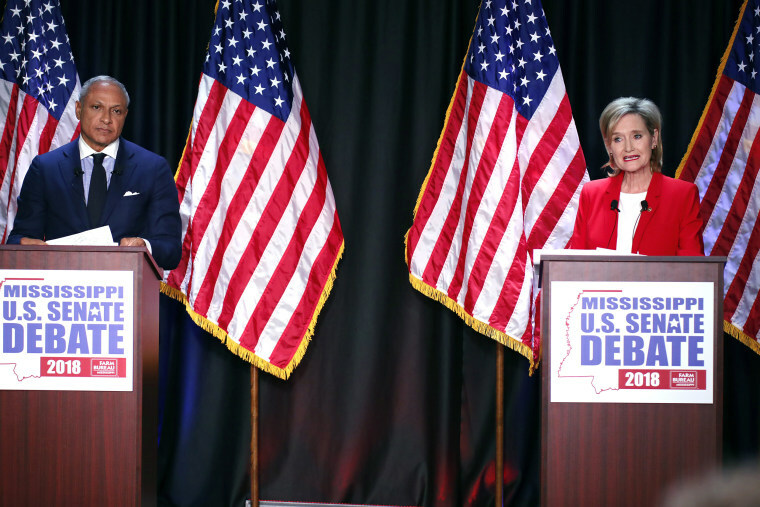 The debate, held at the Mississippi Farm Bureau Federation, was hosted by WLBT, the NBC affiliate in Jackson.